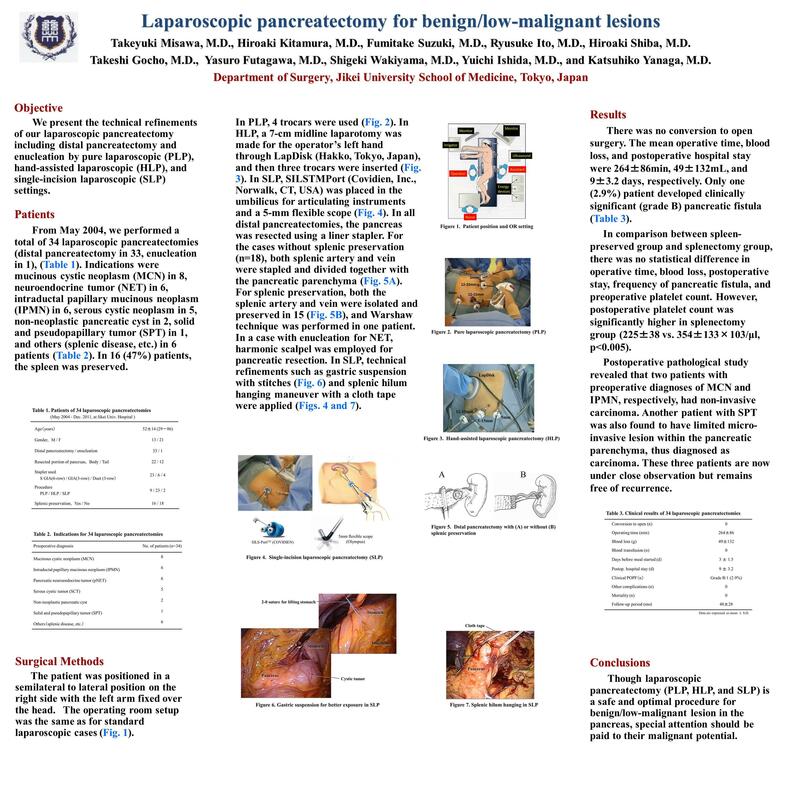 Objective: We present the technical refinements of our laparoscopic pancreatectomy including distal pancreatectomy and enucleation by pure laparoscopic (PL), hand-assisted laparoscopic (HL), and single-incision laparoscopic (SL) settings. Patients: From May 2005, we performed a total of 33 laparoscopic pancreatectomies (distal pancreatectomy in 32, enucleation in 1). Indications were mucinous cystic neoplasm (MCN) in 8, neuroendocrine tumor (NET) in 7, intraductal papillary mucinous neoplasm (IPMN) in 6, serous cystic neoplasm in 4, solid and pseudopapillary tumor (SPT) in 1, non-neoplastic pancreatic cyst in 3, and splenic diseases in 4 patients. In 15 (45%) patients, the spleen was preserved. Methods: In HL, a 7-cm midline laparotomy was made for the operator’s left hand, and then three trocars were inserted. In PL, 4 trocars were used. In SL, SILS Port was placed in the umbilicus for articulating instruments and a 5-mm flexible scope. In all distal pancreatectomies, the pancreas was resected using a liner stapler. In enucleation for NET, harmonic scalpel was employed for pancreatic resection. For splenic preservation, both the splenic artery and vein were isolated and preserved in 14, and Warshaw technique was performed in one. In SL, technical refinements such as gastric suspension with stitches and splenic hilum hanging maneuver with a cloth tape were applied. Results: There was no conversion to open surgery. The mean operative time, blood loss , and postoperative hospital stay were 261±87min, 56±147mL, and 9±3.5 days, respectively. Only one (3%) patient developed clinically significant (grade B) pancreatic fistula. In comparison between spleen-preserved group and splenectomy group, there was no statistical difference in operative time, blood loss, postoperative stay, frequency of pancreatic fistula, and preoperative platelet count. However, postoperative platelet count was significantly higher in splenectomy group (225±38 vs. 354±133×10*3/μl, p<0.005). Postoperative pathological study revealed that two patients with preoperative diagnoses of MCN and IPMN, respectively, had non-invasive carcinoma. Another patient with SPT was also found to have limited micro-invasive lesion within the pancreatic parenchyma, thus diagnosed as carcinoma. These three patients are now under close observation. Conclusions: Though laparoscopic distal pancreatectomy is a safe and optimal procedure for benign/low-malignant lesion in the pancreas, special attention should be paid to their malignant potential.